I’ve been busy charting patterns and dyeing new yarns, so I haven’t posted anything on Ravelry’s 12shawls2012 yet. Last week one of the KAL (short for “knit-a-long”) leaders called me out! Yes, she put me on the spot. Last year I voiced my desire to knit another one of Elizabeth Freeman’s lace patterns, the Torreyana Shawl (Knitty Spring/Summer 2010). I’ve already knit the Laminaria and the Aeolian. A Torreyana KAL is scheduled to kick off February 1st and I’m joining. This will be my first lace cast-on for the year, so I’ll pipe up in the Ravelry group before long. It was a tough choice, but I finally decided that my Torreyana will be knit using Lost City Silk in colorway Extra Virgin, which is a rich olive green. I will also incorporate clear silver-lined beads, which have become my go-to bead for almost all beaded projects. While I have numerous others, for me the simple, clear, silver-lined beads pick up the sheen of silk like nothing else. 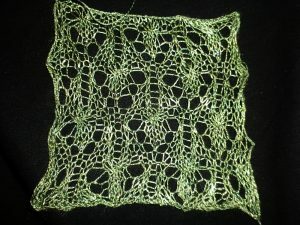 A day or two ago I sat down in the evening with my silk, my beads, and a size 5US needle to swatch. The Torreyana Shawl has an unusual construction in that you cast on over 300 stitches – in the middle of the shawl. It’s going to be fun – geeky lace knitter fun! I’ll be reading the pattern several times over the next couple of days. I’m very excited. New lace! Gorgeous colour! And I have to agree about the beads! I think this will be lovely.